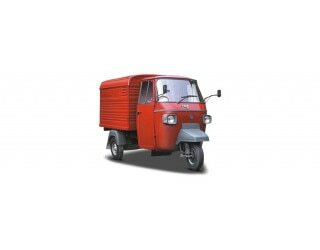 Jan 22, 2019: The Piaggio APE Delivery Van is a perfect vehicle to carry low transportation hauls. It gets a wheelbase of 1,920 mm and the gross vehicle weight (GVW) is 975 kg. It has a kerb weight of 440 kg. Inside its day cabin, a single tiltable steering, driver information display, and adjustable seat are provided. Braking duties of the vehicle are done by drum brakes, while parking brakes are offered too. The vehicle comes with a 395cc, single cylinder, BS-IV complaint which pushes out up to 8 bhp power, coming at 3,600 rpm, and the peak torque of the vehicle is 16.7 Nm, which comes at a range of 2,200 to 2,400 rpm. There is a 4-speed manual gearbox doing the transmission duties, while the truck can go at a max speed of 50 kmph.